And your Funds are FDIC-insured. Receive your pay automatically, usually on payday. Enter the payment details online. The card company will mail the check to your biller. Set aside a little or a lot - be ready for surprises! Buy anything on online, from any seller, anywhere, at anytime. Get relief from charges that you never authorized. See each cardholder agreement on the provider's site for protection details. 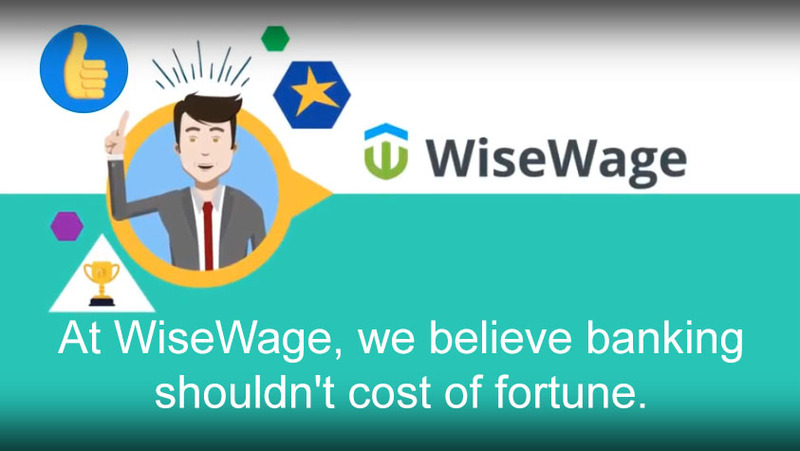 All cards on Wisewage include FDIC insurance of your funds. When you use direct deposit, your earnings are available quickly and for free. Sign your check, open your bank's app, and take a picture of the check. Load cash onto your account at some surcharge-free ATMs. You can send or receive funds from another bank using your routing and account number. If cards on WiseWage do not have overdraft fees, what happens if I attempt to spend more than I have? The transaction will be declined, be it at the point-of-sale or elsewhere. You will not be charged an overdraft or an insufficient funds fee by cards on WiseWage. Why Does WiseWage offer prepaid and debit card accounts? We aim to help every worker. Some workers will not qualify for a standard checking account because of their credit history. Others may avoid traditional banks because of minimum balance requirements and associated fees. Everyone qualifies for all of our card accounts, subject to ID verification. All card accounts on WiseWage provide a full fee listing up front. Can I apply if I don't have a Social Security number? Yes, for some of the accounts offered. Some of the card providers on WIsewage can review an application even if you do not have a Social Security number. They will ask you for other information, like your passport number or ITIN to determine your identity and your qualifications for an account. Currently this is available from Waleteros. If I have a social security number, must I give it to the bank during my account application? The banks will reject an application if they believe that their person has a social security number but has chosen not to reveal it in the application process. The banks use a service that can verify this information on their behalf. Besides, it would create difficulties for you when you file your taxes if you have used more than one form of identification for managing your finances. Is it safe to submit your social security number in the application? While it is always important to be protective of your SSN, our banks are regulated by stringent rules that hold them accountable for safeguarding your personally identifying information. The banks face severe penalties if they fail to honor this legal requirement. The only time a bank must disclose information about an account holder to the government is when as account holder makes a transfer of more than $10,000. Because none of the cards on WiseWage will permit a person to have that much on deposit, such an event cannot occur. A routing number is a unique identifier for a bank. For a transfer of funds to work, both the send and receiving bank need to have their own routing numbers. A routing number is sometimes called an ABA Number. How soon will my funds be available with direct deposit? As long as the employer transmits your payroll two week-days prior to the paycheck date, direct deposits are made available on the paycheck date. Banks vary in what time of the day they release funds. However if the paycheck date falls on a week-end or bank holiday, direct deposit paychecks will be posted on the next day. when the bank is open. The same applies if you receive benefits from a government agency rather than pay from your employer. Once I Deposit a Paper Check, How Soon Can I Use the Funds? If the card you choose allows you to deposit a paper check into your account at a branch or via an ATM, it will usually take several days before all of your funds are available. Because direct deposit is so much faster, many people prefer to use it as the means to process their paychecks. See individual cardholder agreement for more information on applicable fees and funds availability. How Do I Deposit my Paycheck or Benefits? The simplest way to deposit your pay or benefits is to set up a direct deposit. To do that, you will need to know your card account number and routing number. This information is provided to you when you enroll in a card account. It can also be accessed by signing into your online card account mobile app, or contacting your card account’s customer service. See the back of your card for website and customer service phone number. To the right is a sample of a direct deposit form that you can download and print. Provide this form to your employer or benefits provider. If you cannot set up direct deposit, then you can still use the card account to deposit funds from approved checks. Your card account will need a mobile app to achieve this; from the app, follow the instructions to add funds from an approved check to your card account. You can download and print Direct Deposit Forms for the cards on WiseWage here. Can I have my government benefits paid by direct deposit to my card account? Yes, all WiseWage cards can receive a direct deposit of a government benefit payment. Are these cards FDIC insured? Do I have to live in the United States to get an account? Yes, our banks can only send a card to a US address. Banks will not send cards to an address in a foreign country. You can be approved for an account if you are living at an address in the United States, even if you are not a US citizen. Also, keep in mind that if a bank receives several applications from the same address during the same day, they may reject your application because of concerns about the possibility of fraudulent activity. Can I direct deposit my pay to more than one card account? Yes, typically you can designate that your pay can be split up into several destinations. Check with your employer or benefits provider for restrictions or limitations. For example, you could send most to your regular prepaid card account but request that a fixed amount go to a separate savings account. I have bad credit. Can I still get an account? Yes, you can. All of these cards will accept all applicants, regardless of your credit history, subject to ID verification (see below).